NECA’s mad as hell and we’re not going to take it anymore! Oh wait, no, we’re not mad at all. 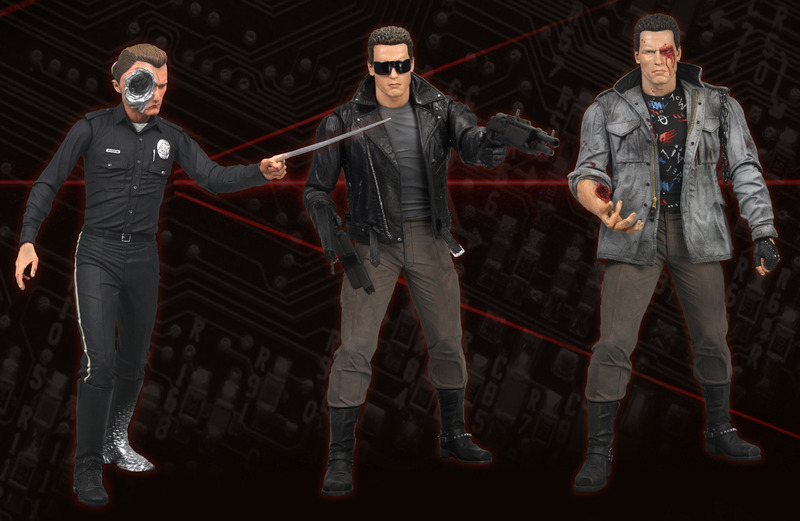 What we are is unbelievably excited to bring you our brand new Terminator Collection Series 2 7″ action figures! I get those two mixed up all the time. For the ultimate Terminator connoisseur, Series 2 is some of our best Schwarzeneggering yet! We’ve got 2 (that’s TWO — as in, also the number of the series) T-800 action figures, including the first-ever figure based on the original 1984 Terminator film. Amazing how well the cyborgs age, isn’t it? That’s the Battle Damaged Tech Noir T-800, and it comes with a rifle and an extra head, just in case one should happen to get blown off in a massive firefight. Both the Police Station Assault T-800 and the Steel Mill T-1000 also come with two heads and other movie-accurate accessories (read: “guns and Linda-Hamilton-shoulder-piercing knife fingers”). All three figures stand 7″ tall and come in clamshell packaging. For more info, click here. The Terminator Collection Series 2 will be available this month. Keep it tuned to NECAOnline.com for more on your favorite games, movies and more! Shipping This Week – Silent Night Deadly Night Billy, Pennywise 1990 Body Knocker, and Restocks of Gremlins Flasher Puppet, Kratos Axe, E. T Head Knocker, and T-800 Endoskeleton!